Set cream cheese out about 10 minutes before preparing this dessert. This will allow the cream cheese to soften and blend easier with the other ingredients. Combine powdered sugar and cream cheese together and mix well. Slowly, add milk into the mixture and beat. Divide cake in half and cut into small cubes. Place other half of cake to the side for later. Lay cubes of cake in the bottom of a 9×13 pan. Spread half the cream cheese mixture over the cake. Cube second half of cake and lay on top of the cream cheese layer. 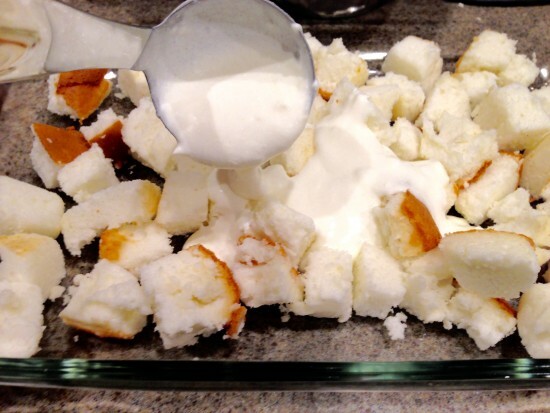 Pour and spread the rest of the cream cheese mixture onto the cake. Top with pie filling. There are many pie filling flavors available. I chose strawberry-rhubarb because I knew that tartness would be a great contrast to the sweetness of the rest of the dessert. You will want to let this set up overnight or at least a couple hours before serving. Enjoy!